It is noteworthy that the 2014 marks the beginning of a new era for Masseto, as this truly legendary single-vineyard is breaking the yoke of Ornellaia. Up until 2014 it has been named Tenuta dell Ornellaia Masseto, but from 2014 onwards it is to be singled out as Masseto, its own winery. In order to achieve this, they are currently building a winery and tasting space. It will remain under the direction of Alex Heinz, who is responsible for both Ornellaia and Masseto but will form its own future, surpassing Ornellaia in stature and global renown, if it hasn’t already. Today’s release price of £1,100 per 3x75cl case represents superb upside. The average price of vintages running from 2005 to 2013 is £1,522, making today’s release of £1,100 an immediate discount of 38% compared to the average case price. It also means today’s release price of £1,100 offers a 54.5% discount to the similar scoring 2005 which trades at £1,700. Today’s release of Masseto 2014 presents incentive to buy on release. 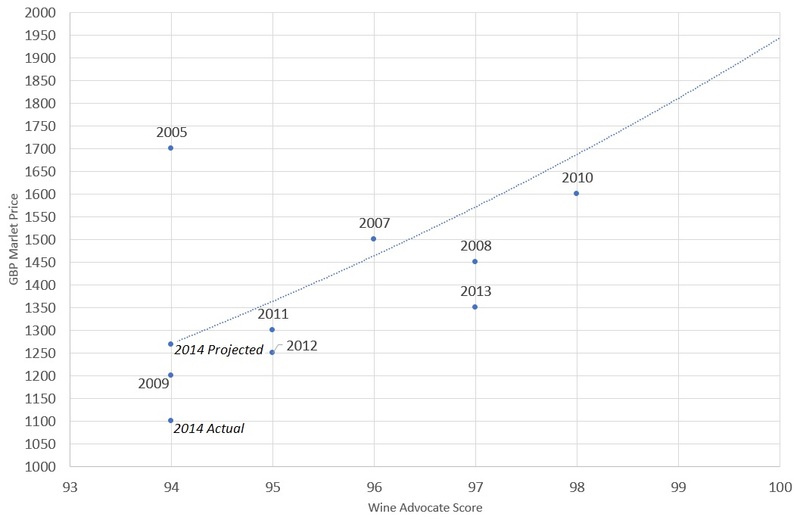 When analysing the Wine Advocate score and current market price from recent vintages, a 94-point scoring wine would be indicative of a natural market price of around £1,275 per 3×75. This is in contrast with today’s release price of £1,100 and therefore presents an opportunity to benefit from the £175 disparity as the market price adjusts to its natural rate. Masseto has shown to have a strong positive correlation between score and price with a coefficient of 0.7142. Masseto is located on the Tuscan coast in Bolgheri and was established by the Antinori Family, who are also responsible for Ornellaia. Masseto is a paragon of wine making, found on the hill of Masseto, which is about 120 metres above sea level. Just like Petrus, its clay terroir allows the soil to absorb and store water, aided further by the sea breeze which keeps the terrain perennially cool. This allows the grapes to grow steadily, without stress; a process which allows them to ripen fully under the warm Tuscan sun acquiring an ideal harmony of sugar and phenolic ripeness. Its parallels with Petrus continue as the Estate mimics Petrus’ low yields; its six hectares produce a maximum of 2,000 cases per year. It is – for all intents and purposes – Petrus grown under the Tuscan sun. Masseto is both rarer and offers better relative value; Petrus produce 5,000 cases per year. Masseto is released on the Place de Bordeaux through negociants and the 2014 like all vintages of Masseto represents a superb investment opportunity and is one of the most sought after 100% Merlot superstars. The 2014 vintage is no different. The 2014 Masseto has developed beautifully over the past few years of its oak and bottle evolution. This is a very distinctive edition of the iconic Italian Merlot that delivers a silky and streamlined approach. As bold and opulent as Masseto is in the warm vintages, I personally find those wines difficult to finish because the extract, concentration and intensity are so over the top. The best vintages of Masseto usually overpower any food dish you put before them. This is a subdued and downplayed expression instead. The cool summer season has shaped fresh berry notes of wild blackberry and cassis with drying mineral, tobacco, licorice and tar. There is evident sweetness here in terms of the wine’s fruit flavors and its tannins, but there also is a cooling vein of acidity that makes the difference. The alcohol feels integrated and light. If you are hankering for a less massive and less muscular Masseto, this vintage is for you. Beautiful aromas of violets and blackberry with hints of spice. Some sweet tobacco. Full body, yet refined and polished with ultra-fine tannins and a long, long finish. The texture and intensity are exceptional. Fantastic for the vintage. Drink in 2021 but a joy to taste.